On 22nd September 2016 the first “season” of Hull City of Culture 2017 was announced. The creative team behind City of Culture delivered a strong and passionate message, which was interspersed by musical performances, poetry readings and a collection of short films. The response to this announcement has been overwhelmingly positive across national press, websites and social media, and if such responses can be taken as a measure of things to come, then Hull’s public image is changing for the better and its people are beginning to come forth and say with pride, “Look at our city.” So, let’s take a look. 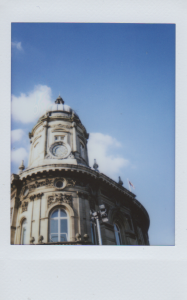 Hull shares its urban landscape with many European cities that also suffered from the aerial bombardments of the Second World War: ornate facades and prominent structures, which date back to days of former glory, stand side by side with post-war prefabrication and reconstruction. Unlike other cities however, the annihilation of Hull’s maritime industries in the mid-20th century devastated post-war areas of the city, which remain all but abandoned to this day. Hull 2017’s first season will feature many events that repurpose the city’s buildings and spaces, encouraging audiences to view and explore the city in different ways. Additionally, as I mentioned in my previous entry, such spaces are also being redeveloped into commercial and artistic hubs, but there are many ruins of industry still untouched and it is to these buildings and spaces to which I turn my attention. Throughout 2017, the spaces in which my music will be performed will have a significant impact upon the music itself. The spaces will provide not only acoustic information, but contribute to the music directly through manipulatable facilities, such as discarded artefacts that can be fashioned into makeshift instruments, and prompt compositional design, such as harmony based upon the proportions of the performance environment. A series of short works will be composed, performed and recorded in these industrial spaces to provide a sonic snapshot of the city during 2017 and assist in the repurposing of Hull’s forgotten quarters. Another major work I will be creating in 2017 is Bethia, which will be the first of my musical pieces to be heard in Hull during 2017. This composition will be performed at Hull Holy Trinity Church: a building that is not an industrial martyr, but one that is a symbol of a rich, dynamic and once-flourishing maritime heritage. It is a piece that uses projected film archives not to dwell upon the past, but to celebrate the bright future of a city that is redefining itself. If you’d like to know more about some of the burgeoning artistic movements within Hull and how the city’s spaces are being repurposed, then take a look at Ground. I’d also encourage anyone interested in building their own creative community within the city to take a look at Hull Art Circle and to explore those long-forgotten parts of the city that will soon become culture’s new playground.